Paul is a pianist, educator, composer, and author. He has been a piano instructor at the Riverdale Y’s Rhoda Grundman Music School since 2003, and has taught students of all ages and skill levels. 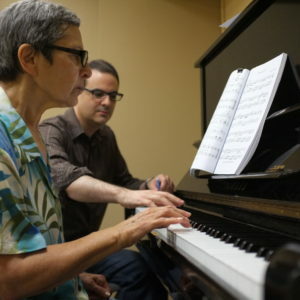 Paul holds a Bachelor and Master’s degree in Piano Performance from Purchase College, and a Master’s in Musicology from the CUNY Graduate Center. Paul has been a music teacher at the Bronx High School of Science for the past eight years, where he founded the Advanced Placement Music Theory and Music Technology program in 2008. He also serves as the music director of the Bronx Science Symphony Orchestra and Choir, and as an adviser to the National Honor Society.